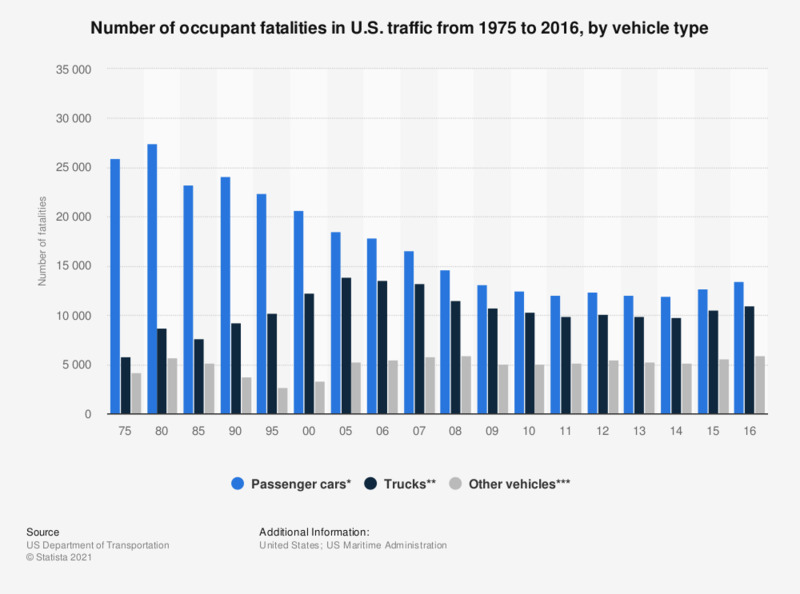 This time line displays the number of occupant traffic fatalities in the United States from 1975 through 2016, with a breakdown by vehicle type. In 2016, there were some 11,000 occupant fatalities involving trucks. * Subcompact cars (includes minicompact cars - wheelbase under 95 inches - and subcompact cars - wheelbase between 95 and 99 inches), compact cars (wheelbase between 100 and 104 inches), intermediate cars (wheelbase between 105 and 109 inches), full cars (wheelbase of 110 inches or greater), and unknown cars. ** Light trucks (trucks of 10,000 pounds gross vehicle weight rating or less, including pickups, vans, truck-based station wagons, and utility vehicles) and large trucks (trucks over 10,000 pounds gross vehicle weight rating, including single-unit trucks and truck tractors). *** Motorcycles, busses, and other/unknown vehicle types.